Sauflon Clariti 1 Day Multifocal The world's first award winning silicone hydrogel, daily disposable contact lens for presbyopia. Award winning Clariti 1 Day Multifocal Contact Lenses are specifically designed for presbyopic contact lens wearers, where the small print is getting harder to read. 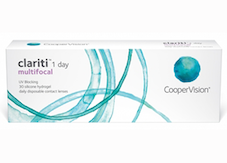 Clariti 1 Day Multifocal provides healthy and comfortable contact lens wear, providing clear vision from close-up to distance and everywhere in between. Made from a silicone hydrogel material, which allows oxygen to pass through to your eyes thus helping them stay white and healthy.